Cool and Spicy » Some new manga, Yotsuba! Tacked on some manga to a recent artbook order from BK1. The manga is Yotsuba &! (よつばと！) by Azuma Kiyohiko (あずまきよひこ). Azuma is also the creator of the very popular Azumanga Daioh series. Yotsuba is an adopted five year old girl who lives with her father in Japan. The story centers around the energetic, playful, and just plain weird little girl. Yotsuba and her father have just moved to a new house and meet their new neighbors, the Ayase family. There are three sisters in the Ayase household: Ena, the youngest, is a inquisitive nine year old who cares about the environment and global warming. At nine years old! Fuka, a 16 year old high school student, is the responsible child. She often goes shopping for her home, likes eccentric T-shirts, and makes bad jokes. Asagi is the oldest daughter and a university student. She likes to play jokes on the rest of her family but is quite caring towards Yotsuba. Fuka: Ah, she took off running! 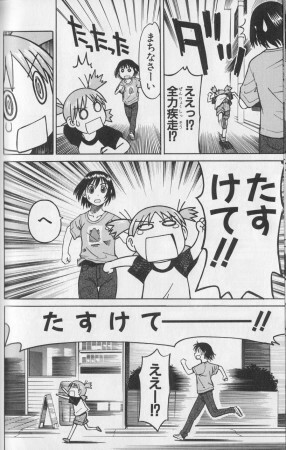 Unlike Azumanga Daioh’s 4koma style, Yotsuba&! uses a full-page format for more storytelling depth. 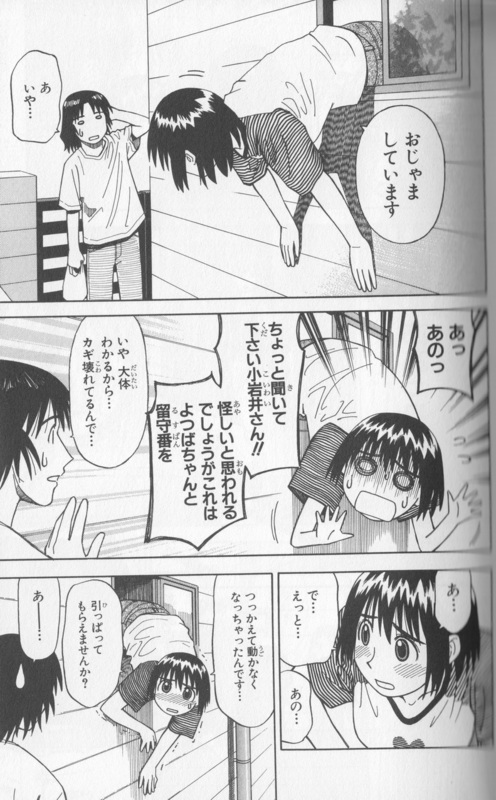 Each chapter is based on one of Yotsuba’s adventures such going fishing, catching cicadas, and going to the pool. The Ayase girls generally appear in each chapter to join in Yotsuba’s adventure. Koiwai: No, it’s alright. I know the lock is broken. Fuka: Uh, so, um… I got stuck, could you pull me out? 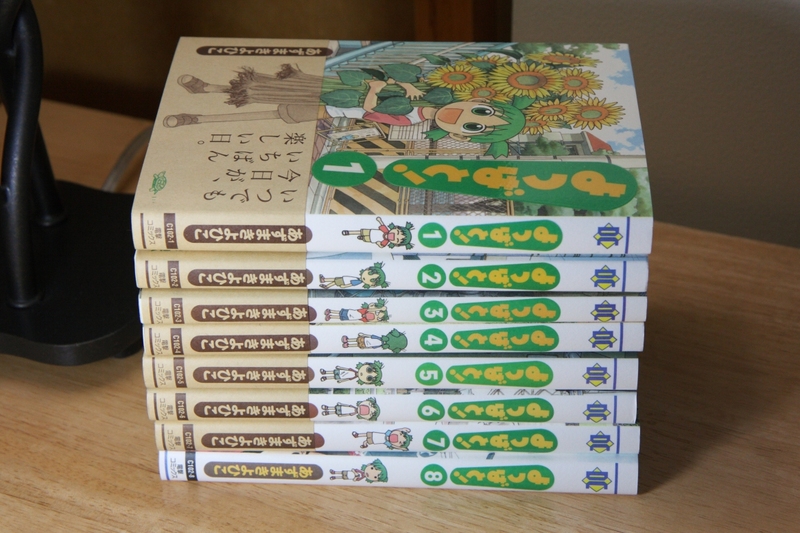 I had previously purchased Yotsuba&! volume 1-3 in English from ADV. However, since ADV called it quits in the manga, I decided to go for the original Japanese editions. It’s good practice for me to read it in Japanese anyway. My kanji skills are rather rusty though >_< For the most part, the Japanese used is pretty straight forward. I’ve read through volumes 1-4 so far. Fuka reacts to Yotsuba's "news"
Yotsuba&! is Azuma’s most recent manga and is still in progress. I read that Azuma is taking break on working on Yotsuba&! to do other things (Like some more Azumanga Daioh). And if you’re looking for aforementioned more Azumanga Daioh, Azuma is drawing a few new pages for the re-release of the manga in Japan. Scans of the new pages can already be found around the web, including translations. 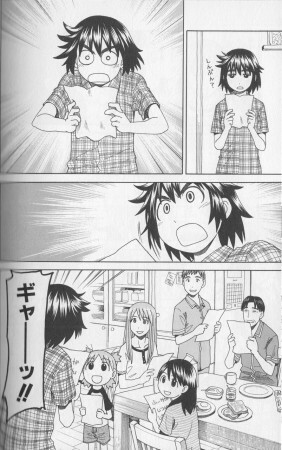 Yotsuba is just awesome, if I could just advise one manga, it would be this one. And for those who are learning japanese, this manga is a good way to improve. The vocabulary is simple (perfect for beginner) and Kanji have furigana. I just recently finished reading Kiyohiko’s Azumanga Daioh in Japanese and have started reading some of Yotsuba&!. Really a great casual read and always funny. I try not to judge something until its finished publishing, but right now I believe I can easily say that Yotsuba exceeds Azumanga Daioh in pure, simple, ridiculous entertainment. Yotsuba is an amazing story. The main story centers around the energetic, playful, and just plain weird little girl. Hey, only seemed to be aware of your site thru The search engines, determined it’s mostly definitely informative. I am just likely to watch out for brussels. I am thankful for those who commence this kind of from now on Manga, Manga Reader, 8Manga, Manga App, Manga Reader App, manga viewer, naruto manga viewer, bleach manga viewer, read manga Android, read manga iPad, read manga iPhone, read manga mobile, best android manga app, manga reader software, android manga reader, iphone manga reader, ipad manga reader. Quite a few other individuals could be benefited away from your producing. Kind regards! Que9 buena noticia! Me enncata este manga! Yotsuba tiene ese ‘algo’ que logra que todos sus personajes te lleguen y te resulten verdaderamente muy cercanos. Un slice of life que entretiene y divierte a partes iguales. Pocos mangas me hacen sonreedr del modo que e9ste lo consigue debido a la absoluta naturalidad con la que se desenvuelven los personajes en cada una de sus simpe1ticas historias. Me parece que lograr esa magia con tanta sencillez es un alarde de aute9ntica genialidad. En pocas palabras: Leed Yotsuba que mola mazo! ← Spice and Wolf’s Horo by Good Smile Co.